Sprinter Sacre routed his rivals with a hugely impressive win in the Victor Chandler Chase at Cheltenham. The 1-5 favourite, trained by Nicky Henderson, secured a dominant 14-length victory under Barry Geraghty. Mad Moose (50-1) was second in the race, rescheduled from Ascot, with last year's winner Somersby (8-1) third. The 2010 Gold Cup winner Imperial Commander, after 680 days off, was just edged out by winner Cape Tribulation in the Argento Chase. Imperial Commander, trained by Nigel Twiston-Davies, looked set for a remarkable victory in his first start since being pulled up in the 2011 Gold Cup, but 7-1 chance Cape Tribulation got up in the final strides. Winning trainer Malcolm Jefferson said the victor, ridden by Denis O'Regan, would return for the Gold Cup in March. He is likely to be joined by Imperial Commander, who jumped boldly and led over the last, and will be given a Grand National entry at the age of 12. 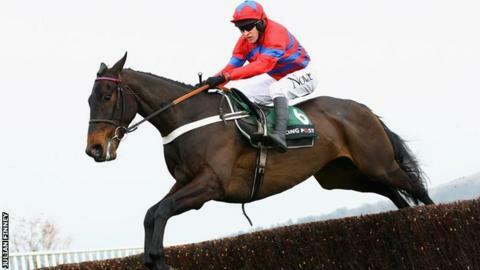 Sprinter Sacre, the highest-rated steeplechaser in training, gave his rider few concerns as he sauntered to his seventh successive win over fences. Geraghty's mount had no issue with the heavy ground and is a hot favourite for the Queen Mother Champion Chase at the Cheltenham Festival in March. "I never had a moment's concern. He's the most natural horse I've sat on. He's all class," said Geraghty, who has ridden top chasers in the past like Moscow Flyer and Kicking King. The gelding will head straight for the Festival for his third race of the season after winning the Tingle Creek Chase at Sandown last month. Henderson admitted to nerves beforehand, acknowledging the seven-year-old horse, who won the 2012 Arkle Chase at Cheltenham, is "a bit special". "He was just a good as he has been before. All really good horses handle any conditions," said the Lambourn trainer. Reve De Sivola won the battle of the staying hurdlers as he passed Oscar Whisky in the final strides to win the Cleeve Hurdle.